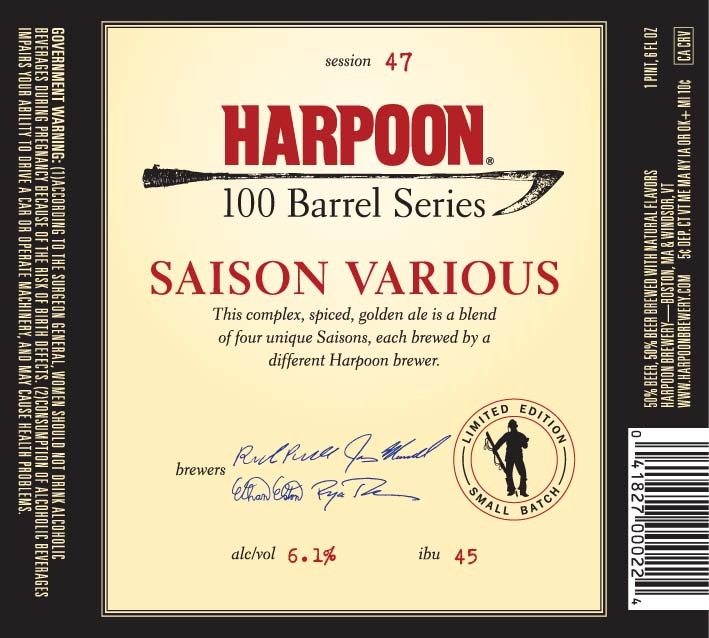 Session #47 in Harpoon’s 100 Barrel Series is in the works. The series allows a Harpoon brewer (or brewers) the chance to experiment and play. Saison Various is the as the name suggests, a little various. Three different saisons were blended together in a fun collaborative effort. In the spirit of collaboration, Jamie stayed true to the farmhouse tradition of brewing without spices while Ryan balanced East Kent Golding hops with coriander and white peppercorn. Ethan’s American hops and a Trappist yeast strain complemented Rich’s citrusy hop profile, and the combined result is Saison Various: a refreshing blend of saisons, brewing sensibilities, and unique ingredients.